Then, a break in Abercrombie, Topshop and Urban outfitters is necessary ! I like to walk throught Oxford street, Regent street, discover Carnaby street and the biggest toy's shop in London : Hamleys . Have you tried Mc Donald's apple pie ? ( don't remember exactly the name sorry ...) What an orgasmic hot pie !!! so cool dimanche à camden!!enjoy!! I love your blog. You should consider writing your posts in french with an english translation. I've seen some other french bloggers do this like godblessparis.blogspot.com. 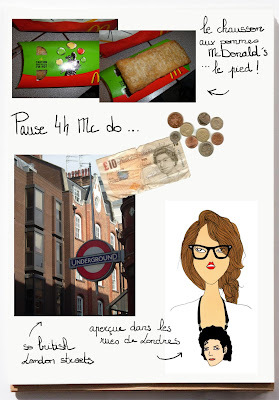 My french is not so good but I love reading french blogs in hopes of improving my french along the way. It is just an idea. your illustrations are so charming =) definitely following your blog!